The Shalom Secrets workbook is written with YOU in mind, and it will show you the way to acheive harmony and peace. Attention kids, aged 9-12: Have you ever been in a fight with a classmate or sibling? Have your feelings ever been hurt? If you’ve answered “yes” to either of these questions, then you are perfectly normal–but why not help yourself deal with conflicts and uncomfortable situations without getting hurt, or hurting others?! Project Resolve is a unique, new technique which will teach you, in a fun and interesting way, how to resolve disagreements and fights while bringing and maintaining true shalom, peace. Children all over the world are becoming happier and more confident through Project Resolve, and now, you can too! 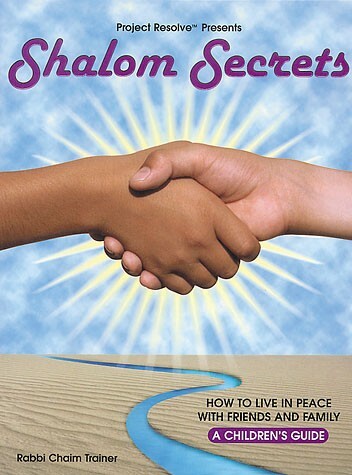 The Shalom Secrets workbook is written with YOU in mind, and it will show you the way to acheive harmony and peace. And for parents and teachers, there is a Teacher-Parent Guide available to be used in connection with the workbook. Work together with your students and kids, and you will see the Shalom Difference in your classroom and home!